Amongst all you’re planning, it’s easy to forget about the men (woops!) since often, they don’t really care about the details, whether they apply to them or not. (Sorry boys, it’s true and you know it!) If he does decide to speak up, or if he’s just not the traditional type in general, why not consider giving him and his friends something a little funkier? Cyberoptix TieLab makes all sorts of cool silkscreened ties that allow you to mix and match ink colors, tie colors, and designs to create a tie that is uniquely your man – or his men. I’m loving the tree emblem in copper, particularly on the brown (how gorgeous would that be for a fall wedding outdoors?). It’s got a vintage feel while being a nontraditional detail that continues to tie the theme together (no pun intended, but it happened anyway, didn’t it?). 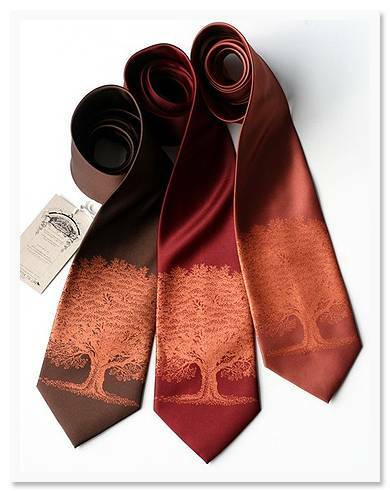 aren’t their ties awesome? I think I wanna sport a tie, just so I could wear one of them myself! Lol.